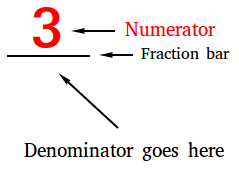 The numerator is the number written above the fraction bar that tells how many of the fractional parts we are talking about or how many of the fractional parts we need to consider. For example, suppose you cut a pie into 8 equal pieces. There are now 8 fractional parts in the whole. If you need serve only 3 of these slices to your guests, then you only need to use 3 of these 8 fractional pieces. Therefore , your numerator is 3. 1 ) Suppose you goal is to walk 6000 steps each day and today you completed 5000 steps ? What is your numerator? Your numerator is 5000. 2 ) Suppose you invite 20 people to a party and only 9 of those people showed up, what is numerator? Your numerator is 9.